Making a film about Greatness is awfully tricky. Greatness takes many forms—selflessness, talent, bravery, forthrightness—and happens amid circumstances both large and small. 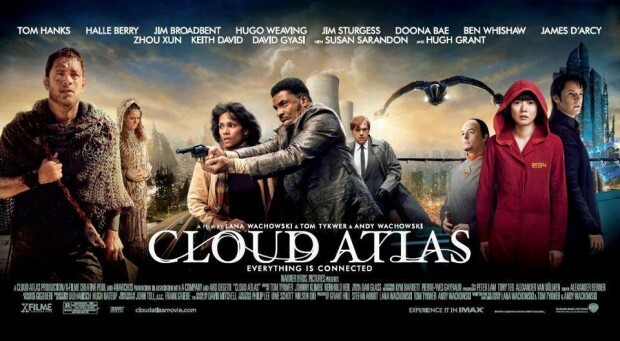 Cloud Atlas is a very earnest attempt, not just to convey, but to wholly embody Greatness. Co-directors Tom Tykwer and the Wachowski siblings have used the enormous scope provided by David Mitchell's novel, which follows a large cast over vast swathes of time, and have tried to weave the half-dozen narrative threads into a single cohesive meditation on humanity. The six narratives span centuries and continents. In 1849, we follow Adam Ewing and Autua, an escaped slave, on a boat journey from an island plantation to Ewing's father-in-law's home in San Francisco; in 1936, composer Robert Frobisher finds himself in a complicated relationship with his musical idol and under pressure to give up credit for his magnum opus; in 1973, reporter Luisa Rey has an accidental meeting with Frobisher's lover Sixsmith, leading her to uncover the dangers of a nuclear facility; in 2012, a hapless publisher reading a manuscript about Luisa Rey is unwillingly committed to a nursing home; in 2144, Sonmi-451, a clone working in a fast-food franchise, finds that her identity crisis is the centerpiece of a revolution; and in a post-apocalyptic society (that worships Sonmi), a tribesman works with a techie Prescient to send a beacon to other planets, hoping for escape from a dying Earth. Though the Wachowski siblings and Tom Tykwer have wholeheartedly undertaken this undoubtedly ambitious venture, the execution is hamstrung by a series of surprising blunders. Some of this is artistic; while each setting is firmly established, the design and cinematography itself is workmanlike and unremarkable—unexpected, given the directors' prior work. More problematically, in order for the disparate tones to coalesce, they ask audiences to maintain two zero-sum tenets at once: they want the audience to recognize their hyperaware winks at the fourth wall, as self-conscious as a stage play; and, simultaneously, they want to use these shortcuts in a movie that, in order to reach dramatic payoff, relies on an unrelenting naïveté that could only be effective if the audience has never, ever seen a film before. Hanks actually appears in all six stories, as characters who seem to be connected by a karmic loop of compulsive scenery-chewing. This dogged, self-conscious artifice might seem a deliberate style choice in a David Lynch movie, but here it draws the audience's attention out of the story with the same level of dramatic payoff as the moving-mole joke in Robin Hood: Men in Tights . Halle Berry, the other bona fide Movie Star in attendance, tries to compensate by moving through the vignettes with a mumbling underpresence. Together, they seem to be doing all they can to sink whatever scene is unlucky enough to have them, and in their paired points of connection (in 1973 and the far future) they serve less as leading actors, or even as obvious reincarnations of fated lovers, so much as jarring reminders of their own ill-matched styles. In theory, there's a sort of summer-stock Zen to the repetitive casting, as the same actors meet again and again in different permutations. (A comet birthmark helps you trace the protagonist of each time period—the character in each section who's marked for Greatness.) In theory, this casting would highlight both the artifice of the medium and the emotional connections formed by the participants even in the face of that artifice. Unfortunately, that would require a surer hand than any of those directing here. That doesn't mean the acting is hopeless. In fact, with the notable exceptions above, the cast is almost universally talented. Some don't shine here—Hugo Weaving and Hugh Grant are locked in a war of supporting-actor attrition measured in relish, and Susan Sarandon seems puzzled about the Future Dialogue she seems to have learned phonetically—but they're party to the tenet of self-reference, and their parts rely on the audience being familiar with their personas more than any particular skill exhibited in-text. But others do markedly better; Ben Whishaw, Jim Broadbent, David Gyasi, Jim Sturgess, and newcomer Doona Bae put in excellent performances, as far as they go. However, they can only go so far as their weakest links let them. That's not to say the movie doesn't have moments of success, even of grace. Ben Whishaw anchors 1936, as composer Robert Frobisher. Acting as amanuensis to composer Vyvyan Ayrs (Jim Broadbent, matching Whishaw scene for scene), Frobisher becomes inspired to work on his own opus, the "Cloud Atlas Sextet." When Ayrs hears it, he insists on both public and private credit for composing it, and Frobisher's race to maintain control of his art ends in the completion of the sextet moments before his suicide. Here, alone among the six segments, the intended thematic elements are executed well—the societal forces working against the characters (Frobisher is bisexual and involved to some degree with both the Ayrses; Mrs. Ayrs is Jewish and has a German ex who spurned her for it), the protagonist's personal quest for Greatness is easily understood as an attempt to enter the wider lexicon of art, and the acting effortlessly carries the thread to its melancholy end. The other segment with potential, 2144's clone-made-good fable with the remarkable Doona Bae as Sonmi-451, has some graceful moments (two fabricants huddled in the dark, watching the same ten seconds of a broken film loop, an artifact of a forbidden outside world; unwitting fabricants singing on their way to the gallows). Sonmi is a compelling character, and her self-sacrifice echoes through centuries and brings her as close to true Greatness as this movie can define—carrying meaning for or inspiring lasting change in others—making it a natural bookend to Frobisher's own quest for the medium of his message. However, it's in 2144 that the dual requirements of playing along with tropes and watching the film in a vacuum fall apart. For Sonmi's romantic savior is played by Jim Sturgess (previously Adam Ewing), playing the role of Hae-joo in yellowface, alongside several other actors made up similarly. Though it hardly measures up to the cumulative effect of white actors in yellowface tiptoeing around accents, this domino effect is felt in small points, as well. Even within the generally successful staggering of scenes to push all six segments forward apace, there are jarring tonal shifts. The 2012 vignette—in which a publisher is committed against his will to an institution and stages a breakout that ends in the staff being beaten by a pub full of irascible Scots—is comparatively slight, and played for laughs despite the traumatic subtext of the material, while still trying to borrow the emotional goodwill of more resonant sections. As the narration speaks of freedom being known only by those from whom it's taken, it's hard to credit a shot of our momentarily glum publisher alongside a shot of the imprisoned, doomed Sonmi-451. Sonmi's single-broadcast elegy, about the interconnectedness of all things and the greatness to be found in the love therein, is meant to represent the moral underpinnings that move the protagonists through all six segments. But the message is muddled both in the mistakes of execution above, and on a deeper and more disappointing level (and no, not the Tom Hanks level, either). Illustratively, the most obvious frame narratives of the film are 1849 and 2144, in which the same romantic pairing is repeated, and textual issues of oppression and revolution are presented. At the end of his narrative, upon reuniting with his wife, Ewing's moral victory is presented as his denunciation of his father-in-law's slaveholding, and his intention to go with his wife to join the abolitionists, because after having been saved by the ex-slave Autua, it matters how you spend your life. And that's true, of course, at least in the context of this film; it's a sentiment often repeated. However, Ewing will appear again as the yellowface romantic lead of 2144 Seoul; Autua is absent from this narrative after he saves Ewing's life, and will also vanish from the future save for a cameo appearance post-apocalypse, and once as a face in a photograph. Hollywood has made a long tradition of co-opting, sidelining, and simplifying the messages surrounding these very issues. As it's too often repeated in Cloud Atlas to be a mistake, it's hard to fathom exactly how it fell out that across time and space, so much of the movie's subtext about the importance of treating others with compassion and respect surrounds the characters of the noble slave or the selfless Asian woman, or is delivered by actors in yellowface that would have given pause to Charlie Chan. It's even more confusing coming from a film that lacks any cynicism or callousness; even its wink-wink nudge-nudge in-jokes, personified most clearly by Hugo Weaving, are used in the movie's final minutes in an attempt at emotional impact, as his fatherly warning about the consequences of fighting authority creates a thematic loop to the fate awaiting the young Mrs. Ewing, who will one day become Sonmi-451 and die at Weaving's hand. For all the flaws under which this film labors, perhaps its most baffling is that the filmmakers were so concerned with Greatness—its origins, its contexts, its personal sacrifices and rewards—that they tried six times, and managed none. There is the instinct to cut Cloud Atlas slack for its earnest mission, its truly heartfelt exploration of the transformative power of Greatness. Unfortunately for the film, earnest and successful are not synonymous, and what we are left with is an opus that seems more like a YouTube supercut than a symphony. Genevieve Valentine's fiction has appeared in Clarkesworld , Lightspeed , Apex , and other magazines, and the anthologies Federations , The Living Dead 2 , Teeth , and more. Her first novel, Mechanique: A Tale of the Circus Tresaulti , is out now from Prime. You can learn more about it at the Circus Tresualti site. For more about the author, see her website. Her previous appearances in Strange Horizons can be found in our archives.